NEW YORK, July 11, 2018 /PRNewswire/ — TGM announced today the acquisition of TGM Odenton (formerly known as Lodge at Seven Oaks), a 396-unit garden style apartment community in Odenton, MD. The property, completed in 2007, is comprised of 14 residential buildings built on a site of approximately 20-acres. The unit mix offers one, two, and three-bedroom apartments with an average square footage of 1,018. The property has a comprehensive amenity package that includes a clubhouse, fitness center, billiards, business center, media room, swimming pool with adjacent outdoor lounge, dog park, grilling areas, and tennis courts. TGM plans to materially upgrade the common area amenities along with enhancements to the apartment interiors. TGM Odenton is centrally located with easy access to major roadways including MD-32 (Patuxent Freeway), MD-175 (Annapolis Road), MD-295 (Baltimore-Washington Parkway), I-95, and I-97. Residents are a short drive from the Odenton MARC Train Station, which connects Baltimore’s Penn Station and Washington, D.C.’s Union Station. TGM Odenton is proximate to major entertainment and retail districts including; Odenton Town Center, Waugh Chapel Towne Center, Arundel Mills Mall and Maryland Live! Casino. “We are proud to expand our footprint in the Baltimore-Washington Corridor with the acquisition of TGM Odenton. TGM is particularly attracted to this area because it is a high barrier to entry submarket with a diverse set of economic drivers. There are employment strengths in the private sector as well as with federal data intelligence agencies due to the presence of Fort Meade.” said Zach Goldman, Managing Principal and Director of Operations for TGM. TGM Odenton is managed by TGMs’ property management company, TGM Communities. Also owned and managed by TGM in the Baltimore-Washington Corridor are TGM Creekside Village (Glen Burnie, MD) and TGM Sudley Crossing (Manassas, VA). The transaction was brokered by William Roohan and Michael Muldowney of CBRE. Founded in 1991, the TGM Group (“TGM”) was organized to provide an integrated suite of asset and property management services to its investors through a series of fully integrated operating companies. Through its vertically and horizontally integrated operating companies, TGM specializes in acquisitions, property management, leasing, construction, property maintenance and asset management services. An affiliate of TGM provides property management services under the brand TGM Communities. 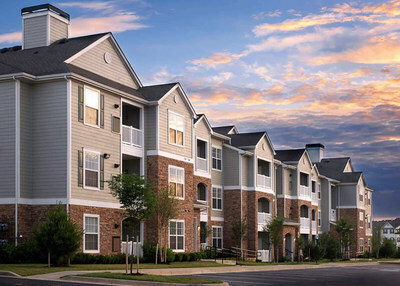 As of June 30, 2018, TGM has invested approximately $2.9 billion in 134 multifamily properties throughout 28 states.